He dashes off a song a day but it took him two years to record his much anticipated new album, was it down to angst or just apathy? Billy Mackenzie, complete Scotsman and embarrassed owner of what has been called "the true voice of pop", is not one of the 693 odd Mackenzies listed in the Tayside telephone directory - much to his record company's botheration. No, Billy Mackenzie has no phone and has only just given up the floors of family and friends for his own "gang hut" . He doesn't much like the London-based pop business... or need it. He has everything he wants right here in Dundee: whippets, berets, the beach, family, friends and a new band partly made up of old school chums who can't quite believe that he prefers their company - "and potential" - to say, Robert Fripp's. "Och, London - that amalgamation of negativity...there are so many inflated twerps putting their health on the line. This pressure to do live work, it's like being tickled to death. I rebel against the whole commodity-ridden business. There's no beauty in it; It's no' worth gaining a quarter million fans and losing two valuable friends. This, he feels, has happened over "Perhaps", Mackenzie's first album in two years (a dazzling curate's egg - albeit a Faberge one) which has been subject to an inordinate number of delays and scandals - "you know, adultery, syringes in handbags, lost master tapes ... that sort of thing" - only to meet with giddy Thesaurus-aided reviews. 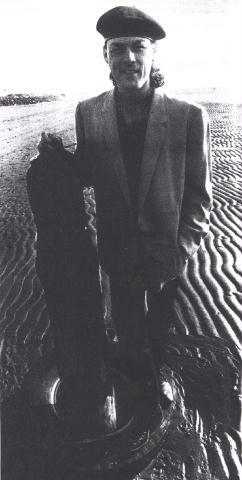 He long ago broke off with fellow founder member of The Associates Alan Rankine with whom heproduced some of the most sumptuous pop music of the decade: albums like "The Affectionate Punch", "Fourth Drawer Down", "Sulk" ...singles like "Party Fears Two", "Waiting For The Loveboat", "Club Country", "18 Carat Love Affair" - all of them distinguished by that bruised, voluptuous, extravagant, ridiculous Mackenzie voice. Billy has been through it all before. The five minute call to stardom. But he's not particularly bothered, in fact quite relieved at not getting there. He has admirers enough. "Aye, right now I'm in the fulcrum, which is a very friendly place to be. I dunno, if I got very successful I might purposely put out bad records - like Bowie's latest - or go instrumental. "I'm no' a businessman's godsend," he smiles. But he's sticking with WEA "just in case". Friends are very important to Billy. When he turns 28 next week, he'll be laying on a gargantuan shebeen for them. Billy is very serious about encouraging his resourceful but unemployed Dundee friends, seeing himself as a "psychic Sugar Daddy" and them as "little Ethiopias". "Look at these jeans ... the best I've ever had in ma life. My pal Scott made these, dead comfy, they'd cost 40 in Demob and don't squash the places that aren't meant to be squashed. Ma wee brother's opening a shop for young designers and I'm putting lit a few pound's." Billy has four younger brothers. He has two sisters also. "All 12-inch extended remixes of me," he clucks. Because of his heavy Celtic background, and a large network of bouffanted aunties and ex-rocker uncles, he can walk the streets of Dundee without fear of molestation though "some of the girruls get bitchy and snooty" and the vexed Queens Hotel receptionist has no qualms about collaring Billy over two outstanding accounts. They all like his records though. "Oh aye, it's always been the women encouraging me to sing. Ma music teacher Dorothy wanted me to go to a 'special' acting school and the gummy whore over the road gave me tea and a biscuit if I did ma Tom Jones numbers with all the actions. She'd burst her bra-strap. I was six at the time..."
The brief but colourful history of William Mackenzie, proud Dundonian, is etched into his wonderfully lively face. The artfully arched eyebrows, pruned before major events like TV appearances and photosessions, conceal scars from his junior-school pugilist days. Billy's face is not simply dashing - a quality he surely sends up when donning his nautical "Loveboat" gear or posing as the "Corsican greaser" on the garish "Perhaps" sleeve - it's face doubly alive with impish impudence. Clever and charming, mischief is its middle name. His age is hard to guess. I wonder how he acquired it? "Drugs? Och, I detest all that decedent Warholian crap and I'm no' into coke anymore. I'm not going into the world to sing to a lot of stoned bastards and I'm no' gonna be stoned when I sing. I'm saving the drugs and books for when I'm 65 and I can't do it anymore. I'm no' setting myself up as some on-the-road guru but I want to chew into real life. That's why I don't like art galleries, why I hated the whole Seventies West Coast music stockbroker mentality. For those were the dark ages, neolithic. All those hippies trying to be alternative rebels or intellectuals when all they really wanted to be was the guy with the big quiff and the lump down his trousers. And me being attacked for liking the Three Degrees!" Warming to the theme, Billy swings his guns around in another direction. "The other day, I was gonna have all jazz rockers gassed ... something so greedy about them wanting to keep all those notes for themselves, all dead precious. But och, I'm trying to be more tolerant. Really. Manoeuvring a forkful of heavy duty cholesterol into my face, Billy grins again. "Here's art for you .. ." We sit in a Broughty Ferry tea-room - no relation to Bryan Ferry whom Billy wishes was his "song dad" (with Beryl Reid as his "actress mum"). In spirit at least Billy Mackenzie has inherited both Ferry's love of a good croon and Reid's remarkable gift for mimicry; in the course of the afternoon he has rendered his three-year-old "willy fixated" niece Vanessa; Lady Palmerstonberry Palmfry, breeder of uppercrufts dogs ("I'd no' mind being one of her affairs") and a particularly virulent Nick Cave ("I collect people and stick them in jars"). He manipulates that quicksilver voice with a practised fluency. The voice, like writing, like performing, like his style, his rapport with animals even, like most things, dammit, comes easily. He doesn't believe in the "tortured artist effect - that's bad conditioning" and his idea of suffering is "half an hour of Crossroads - total nausea". However, he does have his demons. "Performing can be barbaric, looking at someone and seeing them squirm. You know Chaka's been that hurt and if she detaches herself, you think she's being cold and phoney when all she's being is protective. I find it hard to be detached, being too emotional." Right now, Mackenzie is preparing no less than three follow-ups to "Perhaps". Ideally, the man who can pen two songs a day would like to put out a new album "of the highest quality" every four months. "Writing shouldn't be hard, that's a con put about by doom pomp-merchants, though I'm increasingly finding lyrics to be auxiliary. Words lie. Music doesn't. Everytime I come to singing 'Party Fears Two' . ." He stops and flinches: "Och, that was me on a rotten day and I'm no' just the one thing. I'm glamourous, vulnerable, sad, caustic, pretentious, unpretentious like everybody else. The music is the words, not the lyrics. This spritely, grinning figure, who can appear on telly singing, in unearthly voice, a song of inexplicable beauty like "Skipping", and chew gum at the same time, is clearly not to be trusted. Or so thought the Guardian critic who found Billy Mackenzie's problem to be that of having "an uncommonly strong voice but ultimately you don't believe him". Billy Mackenzie doesn't find this a problem at all.